The BFC6 is a strong pallet truck with built-in weighing system, which can transport and weigh goods in the same work procedure. No need for spending time for extra transport and loading! The weighing system has four weighing cells, and a solid and very well protected display. The display has logic and simple settings, and is very userfriendly! It is centrally located, and reading can be done quickly and simply. 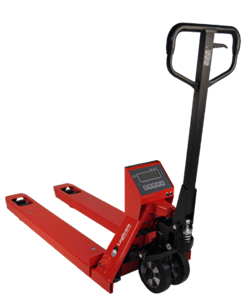 The weighing system is fitted on the ETT pallet truck, which is very easy to operate and maintain.